Psypoke - View topic - PSYPOKE SUPER TRIVIA 2007!!! pelligargetic has not been contacted about their prize. mr_m_m_j and Peanut-lover each received 250 Psybucks for a third place tie. 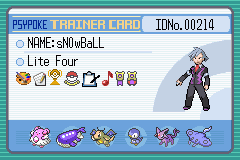 [18:33:15] * FireStarter Of the first nine Pokemon in the Pokedex, how many have names that either start or end with a vowel? [18:33:28] * FireStarter Sneaky_Sneasel 1 Point! [18:36:06] * FireStarter mr_m_m_j 2 Points! [18:37:03] * FireStarter [Blue] Name two of the four routes on which wild Weepinbells can be encountered. [18:37:37] * FireStarter SwampZard 1 Point! 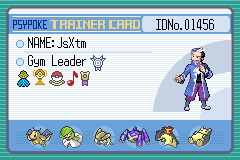 [18:38:11] * FireStarter In Red, Blue and Yellow, Koga is the only gym leader to have more than one of a specific Pokemon. In Yellow, Surge's Raichu is the gym leader's sole Pokemon. Giovanni's team represents the most types in both Red/Blue and Yellow at five. So the question is: How many attacks is the only Pokemon mentioned in this entire paragraph capable of learning by level-up? [18:38:27] * FireStarter Sneaky_Sneasel 1 Point! [18:39:13] * FireStarter Which route connects Saffron City to Celadon City? [18:39:29] * FireStarter Sneaky_Sneasel 1 Point! [18:40:01] * FireStarter Which four items available for purchase in the Viridian City Pokemart? [18:40:20] * FireStarter TonberryKing 1 Point! [18:41:26] * FireStarter TonberryKing 1 Point! [18:42:16] * FireStarter Which Pokemon is the highest in one max stat category, but last in two other max stat categories? [18:42:26] * FireStarter SwampZard 1 Point! [18:43:13] * FireStarter Which four types are represented by only one TM? [18:44:55] * FireStarter TonberryKing 1 Point! [18:45:43] * FireStarter [Pokedex] Which Pokemon's body is so powerful that it must wear a power save belt to regulate its motion? [18:45:53] * FireStarter Sneaky_Sneasel 1 Point! [18:48:41] * FireStarter [Puzzle Challenge] Which Pokemon is unlocked in Challenge Mode by executing a 10 block combo? [18:48:57] * FireStarter TonberryKing 1 Point! [18:49:37] * FireStarter [Snap] What is the only level in which Magikarp does not appear? [18:50:00] * FireStarter TonberryKing 1 Point! [18:50:31] * FireStarter TWO POINTS [Stadium 2] Which Pokemon may be used in place of Toegpi in the Tumbling Togepi mini game? [18:50:46] * FireStarter Krisp 2 Points! [18:52:23] * FireStarter [Mystery Dungeon] Which item increases the likelihood of recruiting Pokemon? [18:52:46] * FireStarter TonberryKing 1 Point! [18:54:09] * FireStarter [Pinball R/S] The 'Arrival' bonus gives you a chance to catch which Pokemon? [18:54:20] * FireStarter TonberryKing 1 Point! [18:54:50] * FireStarter [Ranger] What is the name of the region in which the game takes place? [18:54:59] * FireStarter TonberryKing 1 Point! It has been several years since I have done this, but I shall be hosting the first Psypoke Trivia of 2007! Some of you might be skeptical about this trivia because a non E4 is hosting, but I can assure you that I have done this many, many times before. There will be prizes, non-stop ACTION, and a few twists, so be sure not to miss it! The three highest scoring members (staff and non staff) will get a fancy trainer card ribbon. Every non-staff member who does not finish in the top three will receive 12 Psybucks multiplied by their total points. Saturday January 20th, 6:30 pm CST/7:30 pm EST. Check your timezone here. Trivia will be held on the Chats server in the #PsypokeTrivia channel. To get there, use the java applet found here, and part #psypoke and join #psypoketrivia. 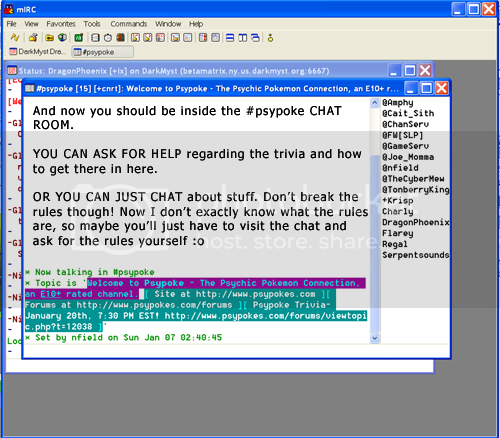 You could also use a IRC chat program and connect to the DarkMyst server (irc.darkmyst.org port 6667) and join #psypoketrivia. 1. No cheating. Please do not attempt to use any reference materials, such as the Psydex or game guides. 2. Do not use the /me or /action commands. The first time you use /me will result in a warning. The second time you will be kicked. The third time you will be banned for three questions. The fourth time will result in a ban for the remainder of the trivia. 3. For every fifth point a participant scores, they will be frozen. While frozen, that participant will not be allowed to attempt to answer the following question. After that question, they will be thawed. If a participant attempts to answer a question while frozen, they will lose one point. 4. You may guess as many times as you wish, unless the question states otherwise. 5. All channel rules regarding obscenity and behavior apply during trivia. DO NOT HARRASS OTHER USERS. 6. My decisions are final. Unless you are ABSOLUTELY certain that I have made an error, please do not pm me. 1. It's too late/early for me! The time was picked to best suit the general population. We can't all have our way. If you're that desperate to attend, sleep in or take a nap to offset your sleep schedule for a day. 2. Is it going to be Pokemon questions or general knowledge? As long as I can make out the words. "gayrads" would be fine since it's clear that you actually mean "Gyarados". Trying to pass off something like "grarghydfn" as Gyarados will not work. 4. How do the Vouchers work? The Name Change Voucher is a pretend coupon which you may redeem for one name change whenever you wish. The Name Change Discount Voucher will allow you to get a name change at the low price of 250 Psybucks!!! You may only use your voucher once, and you may only use it through me. 5. I HAVE A COMPLAINT!!!!! Most likely, the response to your complaint will be "BAWWWWW!!!" Last edited by FireStarter on Sat Jan 20, 2007 11:38 pm, edited 3 times in total. Looks great! I'll try to get there, even though I'll probably get in 20th place for points. Hope to see you all there! One question though: I'm not really used to trivias...how long do they usually last? I am curious.. what benifits do you get if you have more Psybucks? Or rather what are Psybucks used for? I have snooped around and found out that you can buy things from the Slateport Market. Is that all Psybucks are used for? To buy things from Slateport Market? Or are there more uses? Last edited by Wobbi on Fri Jan 05, 2007 6:53 pm, edited 1 time in total. I'll try though I will probably come in like what - 36 th place. 1.) What do you mean by Twists? 2.) How long will it be(number of questions, estimated time length)? 3.) Is Pokemon Diamond and Pearl also being included? What exactly will be on the trivia? RBY, GSC, EmSaRu, FrLg, and PD, the misc games. Anything else, like anime? http://www.psypokes.com/forums/viewtopi ... c&start=60 is the site for psybucks help. Psybucks are used for buying stuff from slateport, trainer cards, or donating. Re: PSYPOKE SUPER TRIVIA 2007!!! I question if you actually read the post, or if you just looked at the topic title. Note: commands and whatnot are available on the mIRC main site. Is West Virginia in New York time? If I said what it was going to be, it wouldn't be much of a twist. Well, the mIRC tutorial Peanut-Lover gave you is pretty much as simple as it can get. However, an alternative would be to try using a different web browser to get to the Java applet. Check your internet options; you might have Java disabled, which is why the Java Applet isn't working. 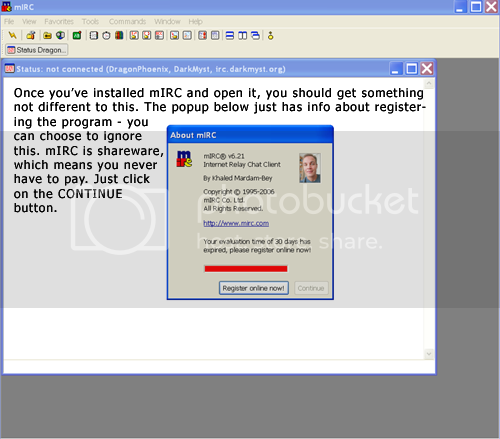 And the instructions for getting mIRC are really as simple as it gets. I suggest you do it step by step to avoid confusion. I gave you step by step instructions on how to access the chats without using the JAVA Applet. This uses a different method - the program known as mIRC. You need to put your forum name where it asks your name, and #psypoke (or #psypoketrivia) in the channel box. 1. First, download the installation file. You can access the install file here, and once it has saved onto your computer, OPEN IT. 3. A POP UP should OCCUR! Select Next > Yes > Install. As for the trivia, I'm still not sure whether I can make it or not. I hope to be there, but if I can't, be sure to have lots of fun without me ! Could anybody please tell me what time zone is colombia in? In nomine....Diabulus et...Belial, Satan, Astharoth, Lucifer et Yahve. -In light of recent events, I have been banned from the psypoke chat room. will i be able to participate in the trivia? This goes for all banned members. I'm pretty sure I'll make it. I'm looking to three-peat. THANK YOU SO MCH FIRESTARTER FOR THE GREAT TRIVIA!!!!! I'll post agian, maybe later. So, I'd also like to take this moment to apologize to FS for the constant pms. Yes, all were my mistakes. Anyway, If you weren't there, it was awesome. DO I get anything special? Thanks fire starter for the trivia. Altough I didn´t enjoy it because I usually had the answer, but thousands of people write it before me. Anyway... congratulations gradevoir and TK for the best scores.